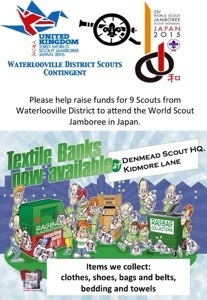 Since installing the clothing bank at the HQ we have sent off 33 bags of clothes, shoes and bags and received £290 for the Scouts going to the World Scout Jamboree in Japan. This is a fantastic start and we have 6 more bags ready to go already. So keep bringing your unwanted clothes, bedding, shoes and bags along. ←Scouts win the Landrover Pull Trophy!